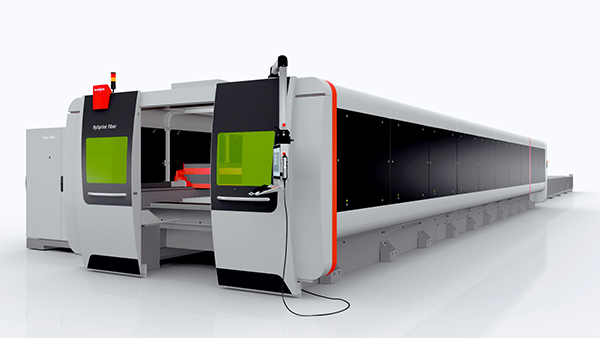 The range of laser cutting systems manufactured by Swiss company Bystronic has been extended with the introduction of a new model capable of processing sheet up to 12 m long by 2 m wide. BySprint Fiber 12020 is able to cut large components or more parts of smaller size, extending versatility and productivity for sheet metal and fabrication shops.The power of the laser source can be 3, 4 or 6 kW to suit the intended applications. As larger sheets allow more efficient nesting, material utilisation is high, so waste is minimised. Bystronic says that its proprietary BySoft 7software supports the user with intelligent nesting routines. BySoft 7 automatically ensures that sheets are used completely and that as many parts as technically possible are nested. To achieve this outcome, BySoft 7 has countless functions, including various nesting processes. In addition to having the ability to cut extra-large metal sheets, the 12020 format machine allows several smaller sheets to be processed bypositioning them next to each other on the BySprint Fiber’s long cutting table, extending uninterrupted production time compared with smaller machines. Bystronic also offers the BySprint Fiber for cutting maximum sheet sizes in metres of 8 x 2, 6.5 x 2, 4 x 2 and 3 x 1.5.